So here I am, a whole year later. My father died Oct. 24, 2017, just as I was in the midst of the itch.io “Epistle 3” game jam. 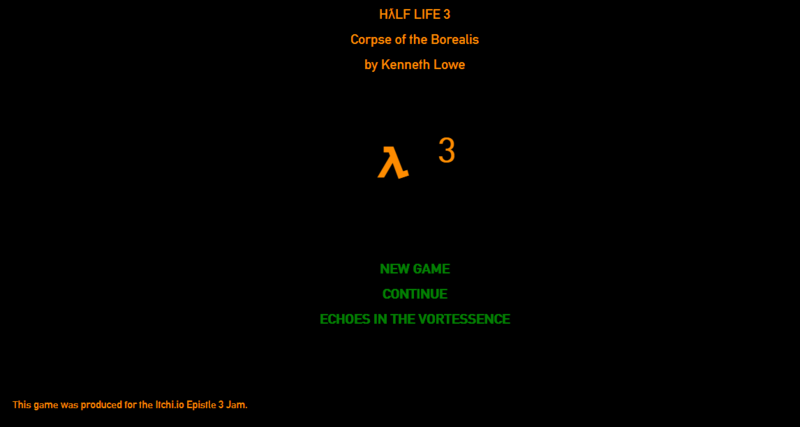 It was running until Halloween 2017, inviting anybody with any gaming know-how whatsoever to do a fan game based on Marc Laidlaw’s cheeky blog post entitled “Epistle 3.” Laidlaw was one of the lead writers on the Half Life game series, which, it has largely been speculated in light of more than a decade without a sequel and the departure of the people most interested in making it, is pretty much dead. Laidlaw’s blog post essentially spells out, with gender-swapped characters and knockoff concepts, the next chapter in the series as he would have liked to have made it.